Half comic book, half soccer catalog…that’s probably the best way I could describe the Acme Soccer & Widget Works catalog. Each catalog followed Billy Preston and his team FC Nil. Bill and his teammates would face different obstacles in each catalog. 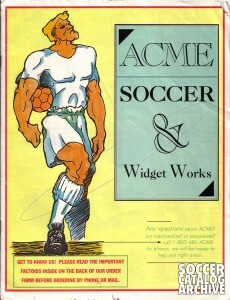 Billy gets his Acme Boots Stolen in this issue…quickly needing another pair of quality boots at a reasonable price…before FC Nil faces off against the mighty Bayern Monster.